George Marotta, also known as “Papa” to me, is quite a fount of wisdom and knowledge. He served in the Army, worked for the United States in foreign affairs, taught at Stanford, and founded a financial firm. However to me, he is my beach bum buddy on family vacations, Don Ravioli in our family mafia movie, and the only grandfather I know to allow his grandchildren to paint his toenails hot pink. Anyway, in this post, I give you Papa Marotta and a little bit of wisdom I managed to get him to share. Megan: You’re quite generous with your money. What advice do you have for younger people who would like to be able to do the same in their retirement? George: As soon as you start earning money, set aside at least 10% to invest in stocks. When you get your first job, invest at least 10% in an “Individual Retirement Account.” If you start saving early, you will get into the habit of “paying yourself first” in your savings before you think of spending that money. M: You’ve had many years of experience with money. What is your favorite thing you’ve been able to do with your money? G: When I first thought that my investments could earn more than I made in salary, that gave me a tremendous incentive to reach that goal. The fact that I could some day live off of my investments was very comforting to me. The fact that money (not only me) could make money was an exciting concept. M: You have ten grandchildren, of which I am one. What are some of your favorite memories of time spent with us? 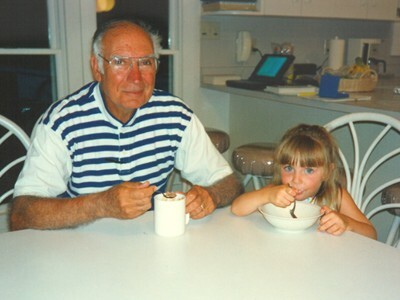 What advice would you have to a grandparent who wants to be involved in his grandchild’s life? G: I always looked forward to the annual family vacations, ususally held on the seashore. Making a movie during that family vacation was always fun, rewarding and made many happy memories on film. To keep up with the grandchildren today, a grandparent has to keep modern: have an account on Facebook and follow some of the antics of their grandchildren. M: You’ve been quite generous with your grandchildren, from Christmas and birthdays to unexpected presents. In your mind, what are some of the best ways a grandparent can be involved in their grandchild’s finances? G: Helping the parents provide for the grandchildren’s college education is a good way to be involved with their lives. Their being able to graduate from college without burdensome student loans gives them a fast headstart in developing their careers. The grandparent can also make sure that their own children do a good job with their finances and serve as a good model for their grandchildren.